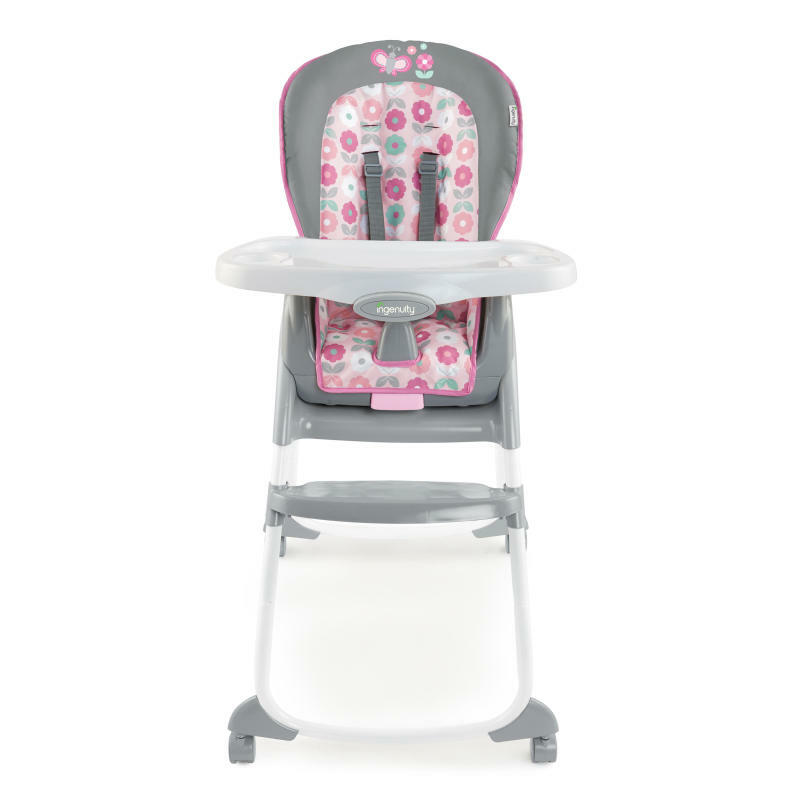 Trio 3-in-1 High Chair - Phoebe is rated 5.0 out of 5 by 6. Designed with parenthood in mind.™ Ingenuity's™ Trio 3-in-1 High Chair™ is every feeding chair baby will need from 6 months to 5 years old! Three modes of use include a full-size high chair, booster seat, and toddler chair. When used as a booster and toddler chair, it can even seat two children at the same time. Ingenuity™ redesigned this best-selling high chair with a modern design and a perfectly pink Phoebe™ fashion for your little one. Comfort is key. The support cushion seat pad helps keep baby comfortable and as baby grows, the seat can recline to 3 positions. Ingenuity™ believes in making clean-ups a breeze. The tray was designed to be easy to wipe, removes with one hand and is dishwasher-safe. The straps and seat pad also wipe down and can conveniently be tossed in the washing machine. Keep baby in reach with the convenient 360-degree rolling wheels. For added safety is a 5-point harness and 2 wheels that lock into place. Rated 5 out of 5 by Valena from Love this Highchair!! I just assembled this highchair today and sat my 6 month old daughter in it and she fits perfectly!! I love how all four wheels swivel and it’s very lightweight and easy to move around. My 17 month old son has the Chicco Polly Progress and it’s such a pain in the rear and heavy, I’m going to buy one of these for him and sell the Chicco!! Here is my daughter in her highchair!!! Rated 5 out of 5 by Valena from Love this Highchair!! I just assembled this highchair today and sat my 6 month old daughter in it and she fits perfectly!! I love how all four wheels swivel and it's very lightweight and easy to move around. My 17 month old son has the Chicco Polly Progress and it's such a pain in the rear and heavy, I'm going to buy one of these for him and sell the Chicco!! Here is my daughter in her highchair!!! Rated 5 out of 5 by Dtamplin from Love it! I love this highchair and for two main reasons. 1) it's versatility to convert into three different positions and 2) it's very easy to wipe off which is an absolute must in my book when it comes to picking baby/toddler furniture. The colors are adorable. It's easy to put together. I really have no complaints. Love it! Rated 5 out of 5 by Jshields from Great product This was received as a gift- great product. easy to put together. fabric comes off for easy clean up. the rest is easy to wipe off. Rated 5 out of 5 by R Hall from Great features!! This is perfect for the parents that don't want to buy 3 different high chairs. It grows with your child. Stage one is for babies being fed in the regular highchair. Stage two straps onto your dining chairs, and stage 3 is like the standard high chairs you see out in restaurants. The back of stage one and two reclines. Rated 5 out of 5 by elarsen85 from All you need This high chair is the only one you need when it come to your babies. It basically grows with them in the sense you can use it as a regular high chair, a booster seat or even a toddler chair! It even reclines! Great quality and durability.